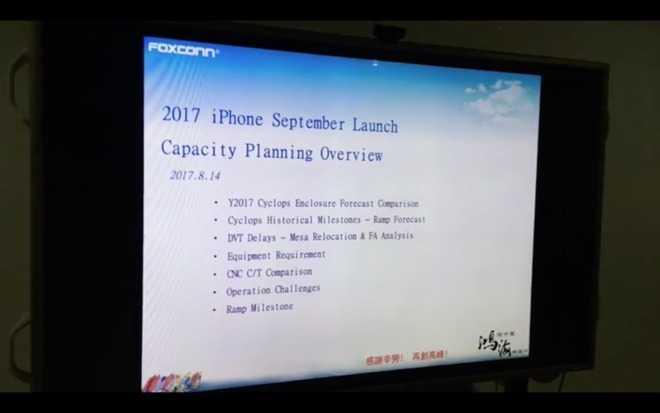 Although the slides — dated Aug. 14 — do use the term "2017 iPhone" at one point, they typically refer to the phone by the codename "Cyclops," according to leaker Benjamin Geskin, who found the video on China's Baidu. It's not clear why the slides are in English, though it's possible that Westerners were present at an associated meeting or would need to see the information. The Touch ID sensor is said to be referred to under the codename "Mesa," and in a slide talking about the Cyclops timeline, text snippets include "Cyclops — ID Rear Touch Relocation" and "Cyclops DVT Kick-off delayed to fixture rework for Mesa cutout relocation and water ingress blocking issue." 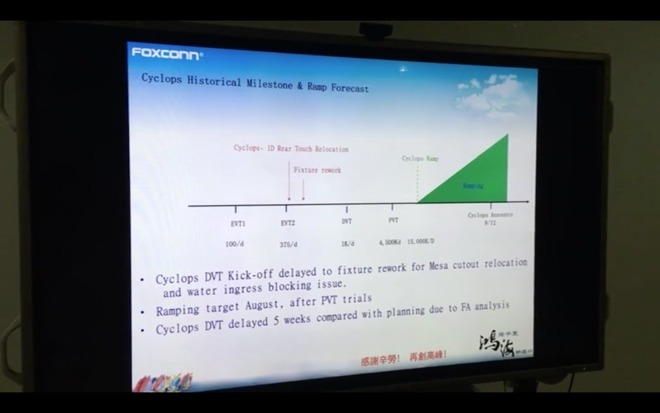 The slideshow also suggests that because of delays, Foxconn was not expecting to ramp up "iPhone 8" production until August, something consistent with other claims of a late start. Apple's assembly partners normally kick into action by July to ensure a sizable number of launch units. Project "Cyclops" (iPhone OLED) development history. P.S. Mesa - code name for Touch ID. The "Mesa" name previously appeared in a Weibo video showing the supposed testing of iPhones with rear-facing Touch ID. A number of parts and schematics —possibly for prototypes —were also once said to support that design, but most recent reports have indicated Apple is replacing Touch ID with 3D facial recognition. The authenticity of the slideshow is suspicious, not the least because it would be relatively easy to fake. There's also no sign of facial recognition or whatever solution Apple may have come up with for Touch ID, given the phone using an edge-to-edge OLED panel with no space for a physical home button. The final product is set to emerge at a Sept. 12 press event, where AppleInsider will provide live coverage.